I’m a creature of habit, and like a cup of green and Earl Grey to start my day and a Red Bush (aka Rooibos) mid afternoon. Approximately nowhere that I go has the tea that I like to drink, so I take along my own stash. This means that I often find myself asking for a cup of hot water when those around me are ordering their teas and coffees, and 99% of the time that isn’t a problem. I sometimes feel like a bit of a cheapskate in high street coffee shops, but then I think of Starbucks and their taxes and the guilt subsides. My teabags are tasty but they’re not magic – they simply infuse hot water with a flavour I like. easyJet sell magic teabags. For £2.50. 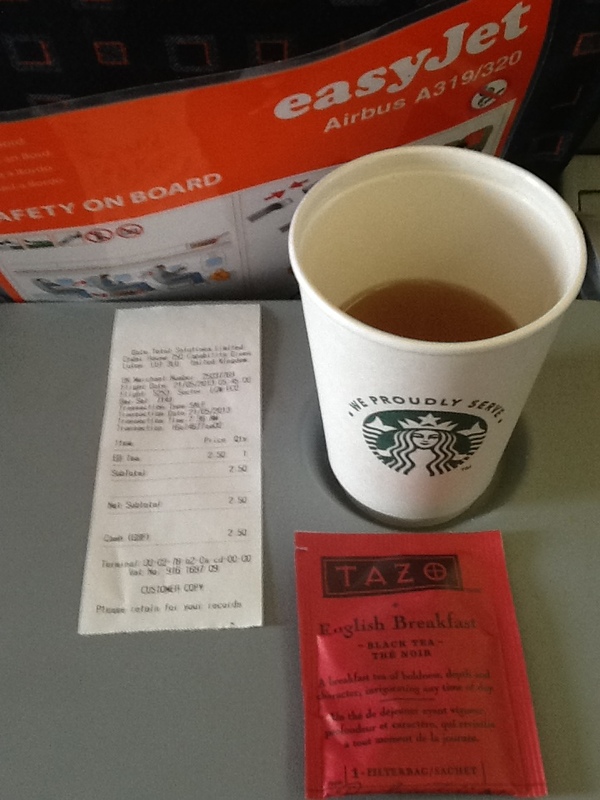 Here’s the magic tea bag that easyJet sold me for £2.50. I have no idea what easyJet’s magic teabags taste like (and let’s face it, £2.50 is a lot for a cup of tea – they should taste great), but the magic is isn’t in the taste. It’s in their safety properties. easyJet teabags turn otherwise dangerous cups of scalding water into perfectly safe cups of tea. I know this because EasyJet cabin crew aren’t allowed to give me a cup of hot water any more for ‘health and safety reasons’, but they are allowed to sell me a cup of tea for £2.50. Since I asked really nicely they even sold me a cup of tea without putting the magic teabag in. I’ll assume that the magic works at a (short) distance – so it’s OK for me to have the teabag on the tray table in front of me, and not OK for it still to be on the cart making its way down the aisle. All I wanted was a cup of hot water (I carry my own tea bags as I prefer a type that is never available anywhere I go). This has never been a problem in the past on Easyjet flights, but this time the crew told me that they’re no longer allowed to serve hot water for ‘health and safety reasons’. Apparently a £2.50 teabag has the magical property of turning a cup of scaling water into something safe. The crew very kindly obliged my request to sell a cup of tea without the teabag being dunked. I got ripped off and nobody was made any safer. Blaming your corporate greed on health and safety isn’t a way to impress your customers. I should point out that easyJet aren’t alone in this shameful practice, they’re just the first airline I’ve found doing it. I’ve also come across it at conference centres where ripoff prices are charged for beverages – Excel, Olympia and Earls Court I’m looking at you. Maybe if I keep my magic teabag I can use it again on another flight. Or does it have some sort of charge that runs out? This is as good a place as any for me to say how disappointed I am that Twinings have discontinued their superb Green and Earl Grey blend. It still gets a mention on their web site, but they stopped selling it a year or so ago. Had I known I’d have bought more than a years supply when I last did a bulk order – of course (like most companies) they didn’t bother to tell me (their previously loyal customer) that they were going to stop making and selling something that I’d been buying regularly for years. I have yet to perfect my own blend of Green and Earl Grey. You buy sufficient tea for a year! Yeowch! If easy jet’s tea bags are magic do you think you can keep it and use it again next time you are on the flight? Ordinary tea has a very long shelf life, so I used to order enough to get free shipping from Twinings, which worked out at about a years supply. I think magic tea has a very short shelf life. It’s hard for me to confirm the specifics without access to inside information, but I’d speculate that the magic charge wears off after a couple of hours. It might also be difficult for the hard pressed easyJet cabin staff to tell the difference between a genuine magic bag and a Tazo bag bought elsewhere. Perhaps next time I buy one I should get it authenticated using a magic marker and some sort of sigil. Does it work for other kinds of forbidden items? I wonder if they allow you to leave your laptop in the bag so long as the magic teabag it taken out for inspection.